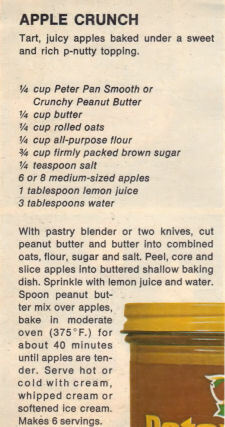 This promo recipe from Peter Pan Peanut Butter was clipped from a magazine and found in a large collection, date unknown. I’ve typed it below along with a scanned copy. Tart, juicy apples baked under a sweet and rich p-nutty topping. With pastry blender or two knives, cut peanut butter and butter into combined oats, flour, sugar and salt. Peel, core and slice apples into buttered shallow baking dish. Sprinkle with lemon juice and water. Spoon peanut butter mix over apples, bake in moderate oven (375°F.) for about 40 minutes until apples are tender. Serve hot or cold with cream, whipped cream or softened ice cream. Makes 6 servings.